You may be looking for the mission of the same name. 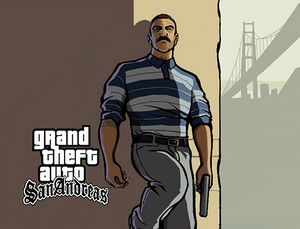 T-Bone Mendez is a character in the Grand Theft Auto series who appears as a main character in Grand Theft Auto: San Andreas. Mendez was voiced by Kid Frost. 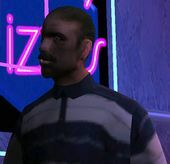 T-Bone Mendez is one of the three members in the Loco Syndicate, along with Mike Toreno and Jizzy B., and is the leader of the San Fierro Rifa gang based in San Fierro. T-Bone is the muscle of the gang and is very distrustful of others, and is seen beating a man to death during The Introduction machinima. T-Bone works with Carl Johnson on a couple of missions but is killed by Carl and Cesar Vialpando during mission Pier 69. It is unknown if he is related to Diego and Armando Mendez from Grand Theft Auto: Vice City Stories. It is possible he owns a ZR-350 as seen in The Introduction and in the mission Photo Opportunity. T-Bone Mendez is one of very few characters to be killed by more than one person. Being killed by Carl Johnson and Cesar Vialpando. Much like Ricardo Diaz who was killed by Tommy Vercetti and Lance Vance, Eugene Reaper who was killed by Patrick McReary and Derrick McReary, and Devin Weston who was killed by Michael De Santa, Franklin Clinton, and Trevor Philips. This page was last modified on 14 April 2014, at 07:11.